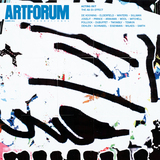 All works: Christopher Wool, Untitled, 2011, silk-screen ink on linen, 10 x 8'. EACH OF THE EIGHT LARGE PAINTINGSall Untitled, 2011that Christopher Wool is showing at this year’s Venice Biennale is dominated by a bulbous central blotch, taller than it is wide. Yet it feels wrong to call these looming blotches “shapes”: They have very few of the characteristics that we understand as constituting shape, since the contours, sometimes defined, elsewhere disintegrate and become patchy, and each nonshape partially continues in a faint area to one side. The images recall Rorschach tests because there are suggestions of symmetry, but one quickly realizes they aren’t symmetrical at all. It is even hard to call these blotches “figures against grounds”they appear so large in the rectangles that they block out most of the outlying space against which they could stand as figure, and what could be the ground is itself too full of other patches and blobs. They might also recall the head shapes in Philip Guston’s 1965 paintings, but again Wool’s forms are too ill defined to really connect to any figurative referents. As for how these blotches have been made, the received vocabulary of abstraction is likewise of little help. They aren’t the outcome of expressive gestures, but neither have they emerged through the kinds of antigestures Wool has deployed in recent paintings that relate closely to the urban environment in which his work is made. Previous canvases have featured sprayed doodles looping around with runoff drips akin to graffiti, messy splashes like dog piss on pavement, broad swaths made with rags recalling the look of painted-out windows in recession-hit stores, and columns of rolled white paint that zip down and block out the images beneath. In the new works, there is nothing that even approximates such antigestures; the blotches do not index any hand movement and are too uneven and graceless to recall spills or splashes. Their way of evoking the city prompts different analogies: They are closer to puddles, rubbed-in stains, or chewing gum ground into tarmac. But each of these paintings is ten feet high, and it is shocking to see these nonchalant, impudent anti-forms in such monumental paintings. They remind me of the closing line of Georges Bataille’s antidefinition of the informe: “The universe is something like a spider or spit.” But as Yve-Alain Bois and Rosalind Krauss made clear some time ago, the formless cannot be reduced to anything like a messy image: It functioned for Bataille instead as an operation, as a process of bringing things down in the world. Could Wool also work with this idea of the informe, and could his processes also be said to deteriorate and declassify? Moreover, could Wool’s iteration of the informe have a particular urgency now, in light of the often conservative contemporary embrace of large paintingand of broader cultural changes brought about by our shifting relationship with technology? Around the peripheries of each blotch we see smaller blobs. 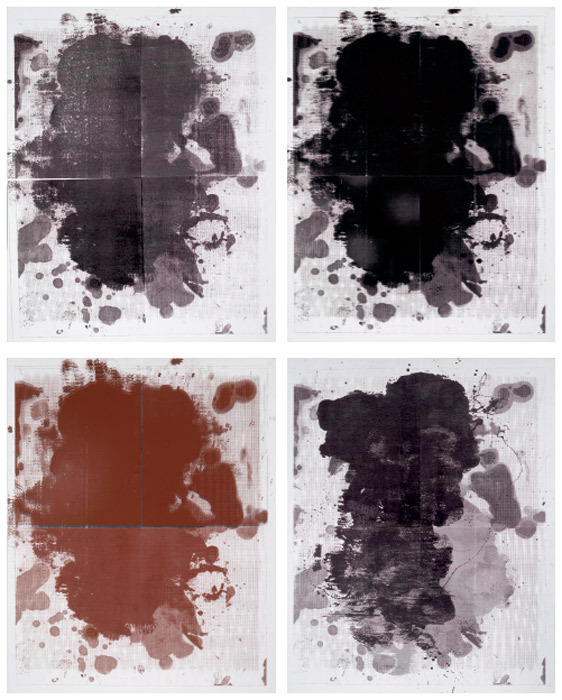 At the top right of six paintings, for instance, there are two dark amoeba-like shapes in a puddle of lighter liquid that seems to have seeped away from the center. Along with various other elements, these irregular peripheral blotches recur in the same place from one painting to the next. By the time we notice them, we already know that the paintings are made with silk screens, and the recurrence of parts of the images tells us that Wool used the same material as the basis for each new work. In fact, he began by photographing small old drawings and printing them out at a hugely inflated scale, which makes their images disintegrate into halftone dots. These blowups might then be worked on with paint, photographed again, fed into Photoshop, and digitally combined with images of other works. Wool also drops out whatever colors were in the earlier works and reduces them to gray scale. It is hard to know, though, just looking at the paintings, what the sequence of these moves has been, or which have repeatedand indeed, our inability to trace the steps of their creation is part of their charge. 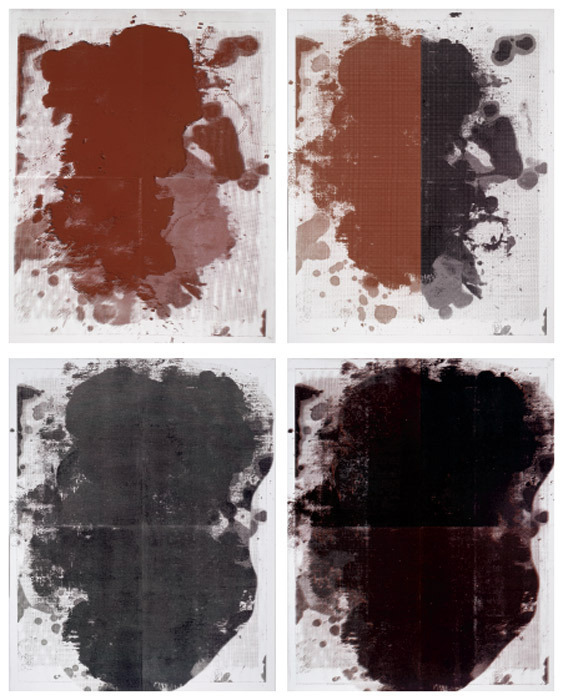 Nonetheless, we can tell that during the silk-screening of these computer-transformed images, further corruptions occur: The ink could be changed from black to rusty brown, sometimes midway through printing a work, so half an image is rendered in black, the other half in rust. Some paintings seem printed too faintly, whereas others are overprinted so many times that their blacks appear inky and tacky. Each painting requires four screens to render its image, and though sometimes the resulting quadrants are correctly aligned, in two works there is a deliberate fuckup, a misalignment leaving a sliver of white at the center of the image, or a gap through which one sees an earlier, differently colored layer of printing. In one painting, Wool double-prints the image slightly off register. It’s wrong to say this makes the image blurryit’s more like seeing double, or taking your glasses off at a 3-D movie. Wool’s processes, that is to say, are those beloved by mainstream image culture: particularly in ad campaigns, in which images are inflated to billboard proportions, tweaked in Photoshop, printed in different colors, and so on, always for the purposes of branding, sales, and spectacle. Wool (who looks back to a lineage of artists who use printing against these purposes, Dieter Roth more than anyone else, but also Daido Moriyama, whose landmark 1972 book Bye Bye Photography Dear includes all kinds of degraded, fragmented, overenlarged, and scratchy images) seems committed to corroding and deteriorating his images and, more generally, debasing the very processes of imagemaking. What makes the new works especially powerful is how different analog and digital deteriorations come to occupy the same plane. Each blotch is based on some original instance of analog formlessness, which is corrupted by being (mis)treated with a number of digital processes and then subjected to further analog deteriorations in the process of silk-screening. The paintings, therefore, are reminiscent not only of puddles or stains but of the stutter of a scratched CD, computer screens frozen for no apparent reason, or the glitches you get when printing out a document that has gone through the feeder of an ink-jet printer at an odd angle, all of which are amalgams of material and coded worlds. In recent exhibitions, Wool has juxtaposed paintings with unique prints on paper made from similar images to those in the paintings, refusing established hierarchies of medium. By contrast, the eight new works for Venice are all the same size and made using the same process, but if this suggests they form a series, experiencing them means witnessing the deconstruction of a series rather than its establishment. We cannot fathom anything in one painting that makes it the successor or precursor to any other, or discover a fixed set of parameters that determines the variations. Nor is there an obvious order in which the eight pieces were made. The lack of a perceptible chronological sequence is tied to the temporal confusion within the worksby which I mean that we have no way of knowing, just by looking at them, which parts derive from earlier drawings, and which were more recently created. Because of this, the paintings can seem metaphors for consciousness or memory, with portions of the image seeming ghosted, parts returning to the surface, and other sections blocked out. But above all, it is the works’ size that destroys our ability to understand them as a series. Simply put, it forces us to look at the paintings one at a time; they are too big to allow us easily to compare and contrast. It is hard to think of other instances in which size has been so critically interesting in recent painting: Usually, of course, paintings get bigger and bigger to satisfy the demands of the market. Wool, however, deploys size as a kind of weapon against those kinds of looking that would attempt to tame his paintings. Largeness is rude here, an assault on vision, akin to the way some of the works make us feel we are seeing double. Wool’s new paintings push the artist’s long consideration of abstraction, shape, and gesture to a different plane. They take up ideas that the artist has long considered: Is a painting based on another abstract painting itself abstract? What kinds of marks are viable after gestural expressionism has been so rigorously questioned? How does an artist show painting’s involvement in technological networks of digital photography and printingyet also engage the specific marks that only liquid materials can form when spilled and smeared, or when their pigments and binding mediums are allowed to separate? Complementing these concerns, the new works raise pressing questions about contemporary experience. If the traditional Abstract Expressionist painting was witness to its maker’s subjectivity, evidence of his feelings, his angst, his bravado (here I sketch a cliché)and if succeeding generations found ways to make antisubjective abstract paintings (whether by transferring found shapes or ceding compositional decisions to preset serial systems or using chance procedures)then how could we describe the approach to subjectivity in Wool’s works? In a recent essay on Moriyama’s “auto-portraits,” curator Simon Baker describes those images where the photographer is rendered as a reflection caught almost by chance in a pane of glass, or as a shadow falling over an uneven surface. The subject is “given over entirely to [the] city,” Baker writes, and the “city somehow yield[s] up (or return[s]) the author from his engagement with it, picturing him as he pictures it.” Wool’s paintings likewise make us think of what it means for the subject to be given over to the city, which seems itself imprinted on the painting. Yet Wool also seems to take into account the ways in which we are affected by our relationships with new technologies. So often we are told that gadgets allow us to control our world: BlackBerries and iPads supposedly enable us to buy what we like when we like, live just as we want to live. But we know as well what it is like to feel the power of technology over us, to submit to the Internet’s round-the-clock calls on our attention or give up our fingerprints at border control. And however many digital screens we own, they can’t shield us from the everyday grime of urban life. In Wool’s new works, something of this double bind is materialized: Painterly gesture is partly ceded to the computer, and its programs are used as modes of distortion; but digital technologies also work alongside older material processes of corruption, with final say given to the messy analog machine of the silk-screen press. Each central blotch is an outsize monument to the material residue of the density of urban life as well as witness to a morcellated subjectivity assailed by the technologies that cut it down the middle or split it apart. These works are not merely reflections of damaged subjectivity, however. One of Wool’s most celebrated text paintings from 1991, reads THESHOW ISO / VER THEAUD / IENCEGET UP / TOLEAVE THE/IRSEATS TI / METOCOLLECT / THEIRCOATS / AND GOHOME / THEYTURN AR / OUND NOMO / RECOATS AND / NOMOREHOME. Just as the blunt rows of stenciled letters in that piece staged a kind of protest against the 1980s obsession with property and entertainment, the defiant size and purposeful inscrutability of the new works make manifest a comparable oppositionone that militates against and ultimately refuses the ceding of the subject to the city and to technology. Mark Godfrey is a curator of contemporary art at Tate Modern in London.